For the second straight game, the Washington Mystics have found ways to stay close in a game, but can’t seem to find the right combination to finish with a victory. 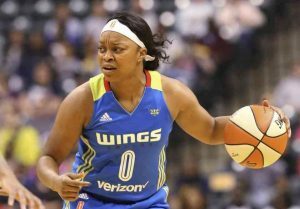 This time it was the Dallas Wings without guard Skylar Diggins who rallied late in the fourth quarter for a 87-77 victory. Washington got within 74-71 with 3:44 left, but Dallas scored on its next three possessions for an 81-73 lead. Christmas and Sims sealed it by combining to make 6 of 6 free throws down the stretch. Erin Phillips made three of Dallas’ eight 3-pointers and finished with 16 points. The Wings (2-1), who are ranked No. 7 in the AP WNBA power poll, also got 10 points from rookie Aerial Powers. Tayler Hill went 11 of 15 from the free-throw line and had 20 points for Washington (0-2). Emma Meesseman added 19 points with seven rebounds for the eighth-ranked Mystics. The 19 points by Messeman was a much better performance than her first game where she just looked tired and our of the offense.